Bolt Function: Spring Bolt by default, if need deadbolt (more secure in some situation), put 'Deadbolt' in notification field. 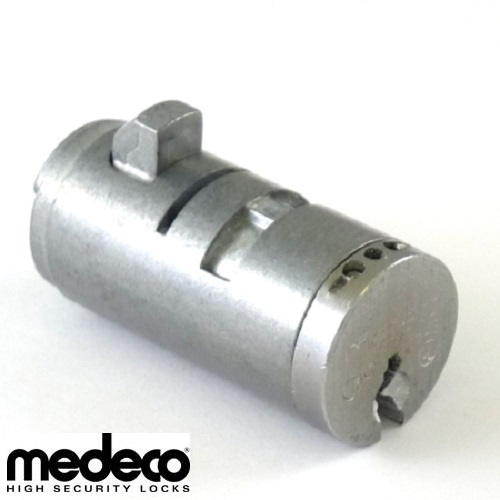 This Medeco high security vending machine lock cylinder with security level options is designed to replace standard T-Handle cylinders in a lot of vending applications. It is built to order by Medeco authorized manufacturer. 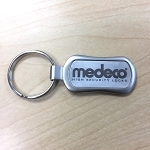 Medeco keys may only be duplicated by Medeco or authorized Medeco service center, and only at your request. Medeco® provides a full range of T-handle cylinders, from general purpose models offering basic key control and pick resistance, to stainless steel bolt and shell models resistant to the most severe forms of vandalism and physical attack. All models may be keyed in together, as well as with other 60 series products, for ease of key management. Medeco has over twenty-five years of experience manufacturing locks for the vending industry, and a proven track record of quality products and long term reliability. Patented key programs prevent the unauthorized duplication of keys and maintain system integrity. 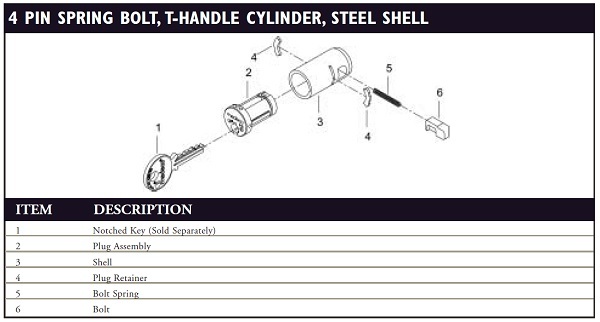 Medeco T-handle cylinder bolt and shell are constructed of high density zinc die-cast or stainless steel for higher security applications. Plugs constructed of machined brass with drill resistant, hardened stainless steel inserts. 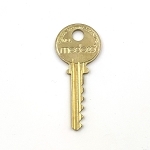 Patented Medeco keys may only be duplicated by Medeco or authorized Medeco service center, and only at your request. Medeco cylinders are serviceable, and can be re-keyed by authorized Medeco service centers in case of lost or stolen keys. Medeco T-handle cylinders can be keyed in with other 60 series products (10 series products may be keyed into existing 60 series systems). All cylinders retrofit NAMA standard T-handles. 26 satin chrome finish standard. I used this lock in my American Changer change machine and it works just right. Was easy to change out the lock because I had viewed a video online on how to do it. I would buy this again if needed. I was happy to be able to get the number of keys that I wanted. Product is as described. Ordered 2 locks keyed the same. Came with 2 keys. Price is excellent compared to what other people are charging. Delivery cost was very reasonable and received shipment in 2 days after ordering. 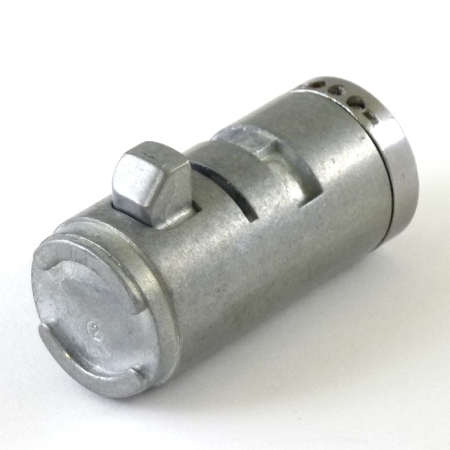 Great lock cylinders with options. Just ordered another 12 with the same keys. Very happy about the quality. My application needs higher security level. 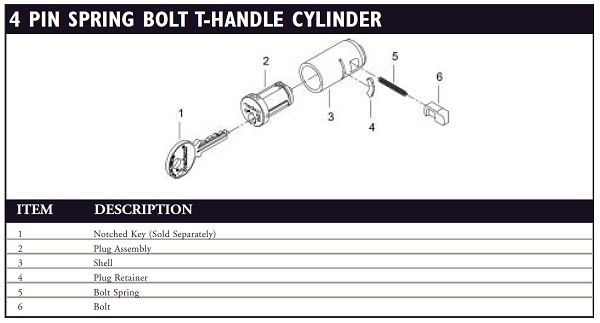 Regular vending cylinders with tubular keys are easy to pick or drill. Those medeco vending locks offer pick and drill resistant with angled keys. Q: Is it possible to purchase two locks keyed the same with two keys? A: Sure. Select material according, 1 key per lock, then check keyed-alike box. Change Qty to 2 before adding to the cart. Q: Will this medeco lock fit a t handle dixie narco soda machine ? A: Yes, it will fit. 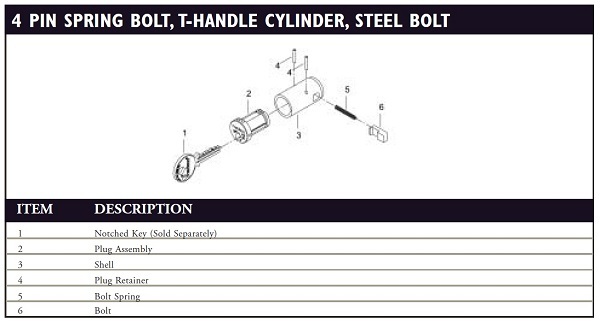 Dead and spring bolt functions available. 180 degree rotation to open. Locks fit all NAMA standard t-handles. Medeco® 0155 and 0750 series T-handle cylinders provide solid, general-purpose security, defying surreptitious entry via picking, drilling, and unauthorized key duplication. 0155 series comes in a 5 pin body design to maximize keying potential. 0750 series comes in a stout, 4 pin body style, to better resist physical attack. Both 0155 and 0750 are available in either spring or deadbolt models. With enhanced security features, Medeco 0950 series T-handle cylinders are for use in higher risk locations where the chance of physical attack is greater. With a solid steel bolt and reinforced shell, the 0950 is designed to resist would be thieves. Available in a 4 pin body style with either spring or deadbolt functions. For locations where your property and profits are most vulnerable to theft and vandalism, Medeco® 1050 series provides the most protection possible in a 3/4'' T-handle cylinder. With a solid steel bolt and shell, the 1050 is designed to resist even the most severe forms of physical attack. Available in a 4 pin body style with either spring or deadbolt functions.